Dark circles under the eyes can be from true darkening of the skin (hyperpigmentation), or from conditions that give the appearance of dark circles. The causes are common to all, whether you are dark-skinned or lighter-skinned. However, your darker skin has more melanin pigment (the substance responsible for skin color) in the skin cells so your dark circles may be more obvious. Your treatment choices to remove these dark circles will depend on the specific cause. Consider using a concealer to cover darkened areas temporarily while you are treating the cause of the problem, or if other options don't work. There are several options for treating or removing dark circles under the eyes in black skin. Sometimes you have to combine treatments, depending on the cause of your dark circles. Consider the less costly and least invasive options first. Take care that the options you select do not lead to more darkening or other blemishes that darker skin tones are prone to, such as keloids. First step in treatment options is to take a look at your lifestyle habits and take preventive steps. 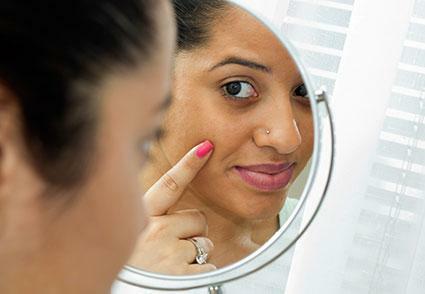 Poor sleep, stress, smoking, alcohol, sun-exposure and a poor diet can lead to diminished skin health and cause hyperpigmented circles to appear. Too much salt or not enough water can cause puffiness, bags and water under the eyes that lead to shadowing and give the appearance of dark circles. Reduce or limit alcohol and cigarettes. Decrease salt intake to decrease puffiness and bags. Change your sleep position by elevating pillows to drain fluid from under your eyes. Don't sleep with makeup on. Makeup can irritate your skin and cause you to rub your eyes, which will cause hyperpigmentation. Wear a sunscreen to protect skin to decrease the chance of sun damage. Decrease stress and discover ways to relax more. Eat a healthy diet. This will lead to improvements in your skin overall. Allergies, sinusitis, colds, nasal congestion and lifestyle choices can cause puffiness, bags, water retention and dilated blood vessels under the eyes, any of which can create the look of dark circles. Try these home remedies. Cold compresses can be soothing to the skin. They can also reduce bags and puffiness, as well as shrink blood vessels. Use cold cloths, cold tea bags, cucumber slices, potato slices and cold teaspoons. Apply any of these choices to your closed eyelids while you lie down, rest and relax. Gently press them under your eyes to massage the fluid out. A neti pot drains fluids - that contribute to water retention and bags under the eyes - from your nose and sinuses. A neti pot is a little teapot in which you put a salt water wash to irrigate your nasal passages, sinuses and throat. Neti pots are available in drug stores, health food stores, and netipot.com. Popular brands of OTC products are easily found in drug stores and health and beauty stores. Some brand products are expensive so compare and look for pharmacy brands with similar ingredients. Apply creams gently and carefully to the delicate skin under your eyes and follow the directions of each product. Retinol creams can tighten, brighten and thicken aging skin by renewing cells on your skin surface. These are mostly sold as anti aging creams. Retinol is a retinoid, a derivative of vitamin A. It is an OTC version of prescription-strength retinoids. Retinoids strengthen collagen in the skin, and can plump up the skin, evening out hollows to reduce the appearance of sagging and puffiness. Under-the-eye hydrating creams are a good option for aging or dry skin. They can add or lock in moisture in dehydrated and sun damaged skin and plump up under-eye hollows. These creams can brighten the appearance of aging skin under the eyes. Many of these creams contain vitamins such as vitamin C, an antioxidant important in skin renewal. Nivea Creme Body Creme is a rich moisturizer that can be used as an under-the-eye hydrating cream. Pat a small amount under your eyes to hydrate dry, itchy or sun-damaged darkened skin. It can prevent you rubbing your eyes and causing more skin darkening (about $2 for a travel size can or about $7 for a 6.8 oz jar). Products with vitamin K, such as Vita-K Solution Professional Dark Circles Eye Treatment ($12.99), can also reduce dilated blood vessels and renew skin cells in darkened areas. Use fade creams with 2% hydroquinone for true hyperpigmentation that is not temporary, caused by heredity, rubbing your eyes because of sun damage, or allergies and other irritants. Avoid prolonged use under the eye and do not combine products that contain hydroquinone with other skin lightening products or prescription-strength retinoids. This could irritate the delicate skin and cause greater hyperpigmentation. Ambi skin bleaching cream ($5-6 per tube) is popular and has been used for years by dark-skinned women. It takes about two weeks for noticeably lighter skin. The cream is available in beauty supply stores, pharmacies and online stores. Hydroquinone is a synthetic, industrial product heavily marketed to darker skinned women of African, Asian, and Mediterranean descent. Its use is very controversial and has been banned in several countries because of concern about cancer. Long-term use can also cause ochronosis, a bluish tinge to the skin. In 2006, the United States Food and Drug administration (FDA) attempted a ban on all hydroquinone products skin products. The OTC 2% and prescription 4% hydroquinone are currently still available in the U.S., but use with caution and in small amounts. Prolonged use, especially on large areas of the body, can increase the risks of complications. To reduce congestion, puffiness, fluid, and bags, you can take OTC oral antihistamines to treat your allergies, hay fever and colds. OTC brands include Allegra, Allegra D and Claritin, all available in drug stores and supermarkets. See your doctor if you need stronger antihistamines than you can purchase without a prescription. If lifestyle changes, home remedies, and OTC preparations don't help, consider seeing a doctor for further help. Retin A® is often prescribed for aging, sun-damaged or hyperpigmented skin. Retin A® and other prescription-strength retinoid creams or gels can tighten and brighten aging or damaged skin and improve hollows under the eyes. This product can renew skin surface cells and brighten the skin. Use with care near your eyes. It can be drying and cause irritation, worsening your problem. Cost ranges from $40 to $75 per prescription. Your doctor may prescribe prescription-strength hydroquinone to lighten hyper-pigmented skin if OTC hydroquinone does not work. Make sure that you are fully aware of the cautions and warnings associated with hydroquinone before using. Discuss the risks thoroughly with your doctor and make an informed decision. Be certain to discuss cosmetic options in great detail with your doctor before deciding t go this route. Consider carefully that after these procedures the skin may scab and has to heal and your problem could look worse after healing. For any of these procedures, find a skilled, experienced doctor who understands melanin production and is used to treating people with darker complexions. If you choose a cosmetologist for a chemical peel follow the same advice. These procedures use chemicals to exfoliate the skin. They remove the top cell layers of skin where more melanin is located and can lighten and brighten the skin. A light chemical peel can cost $600 to $900; a very light peel is about $150. Hyaluronic acid fillers fill in hollows due to aging, sagging skin under the eyes and may be an option. Products include: Restylane®, Juvederm®, and Belotero®, which is the newest and the only one FDA-approved for this purpose. Fillers last about a year. Laser resurfacing can tighten and firm aging, sagging skin. This treatment option can reduce the appearance of dilated or broken blood vessels. Laser treatments can also lighten the appearance of skin by removing the top layers where melanin accumulates. The cost is about $2,300 to $2,500. Blepharoplasty is a surgical procedure commonly known as an eye lift. This procedure can remove aging, sagging skin, puffiness or bags under the eyes. It can also remove or reposition fat pads to even out hollows and remove darkened skin. Can cost $2500 to $5,000. Before you decide on an option to remove dark circles from under your eyes, gather as much information as you can. Consider all the pros and cons, side effects, and benefits before applying any of these treatments to your face. Don't hesitate to ask your doctor or cosmetologist detailed questions, especially about prescription-strength products and cosmetic procedures.